The glycemic index (GI) is used to rank carbohydrate-containing foods according to their effect on blood glucose levels after eating. Low GI foods are slowly digested and absorbed and so produce only small fluctuations in blood glucose and insulin levels. 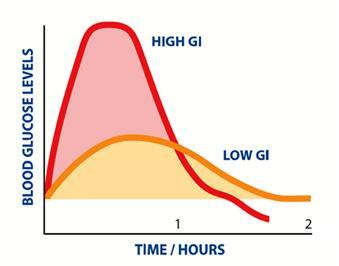 By contrast, high GI foods are rapidly digested and absorbed, producing a more pronounced fluctuation in blood glucose levels. Reduced insulin levels and insulin resistance. Increase HDL cholesterol and reduces LDL cholesterol. Protects against cardiovascular disease by reducing inflammation. Reduced risk of some cancers by reducing insulin levels. Lowers abdominal fat (low GI increase insulin sensitivity which allows you to burn more fat as a fuel source and process your carbohydrates more efficiently). While low GI is useful when choosing carbohydrate foods it is not necessary to eat only low GI foods to achieve a low GI diet to assist blood glucose control. For people with diabetes, the recommendation is to make low to medium GI foods the focus of their day-to-day diet. It isn’t necessary to exclude all high GI foods, provided lower GI foods are the mainstay of the diet. Eating a variety of intact grains, legumes and low GI grain foods lowers the overall GI of your diet. Most legumes such as chickpeas, beans, peas are a source of low GI carbohydrate.